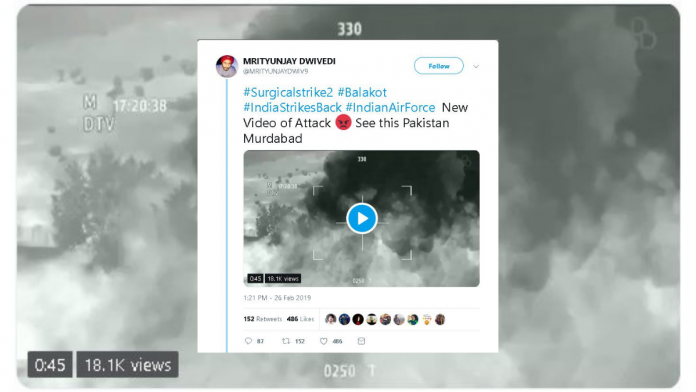 New Delhi: Soon after reports of Indian Air Force strikes on the biggest Jaish-e-Mohammed training camp in Balakot in Pakistan’s Khyber Pakhtunkhwa province came in Tuesday, a fake video of the “attack” went viral. The video, claiming to be a snippet of Tuesday’s strike, began to be widely shared on messaging service WhatsApp and social media platforms Facebook and Twitter. The video received close to 18,000 views. On Facebook, the video was shared by a page called Bonno Troll and received over 1,000 views and 80 shares. The video has actually been sourced from a military simulation video game called ‘Arma 2’ that includes “team-based combat, a comprehensive playbook of military tactics and an enormous battlefield to push your twitch, tactical and strategic skills to the limit”. The operation it simulates is called “US Army engages Taliban in Takistan Mountains” and is a complete work of fiction. The two-minute video has nearly 2 million hits on YouTube. It was uploaded on 9 July, 2015. The “intelligence-led” airstrikes Tuesday came less than two weeks after a suicide car-bomb terror attack by JeM in Kashmir’s Pulwama district killed 40 CRPF personnel. The government’s response to the attack in the form of the airstrikes is being lauded across social media platforms. In a statement, Foreign Secretary Vijay Gokhale said India had credible intel that the Pakistan-based group was planning more suicide attacks in the country. The Pakistani government, however, claimed that no casualties or damage was caused.